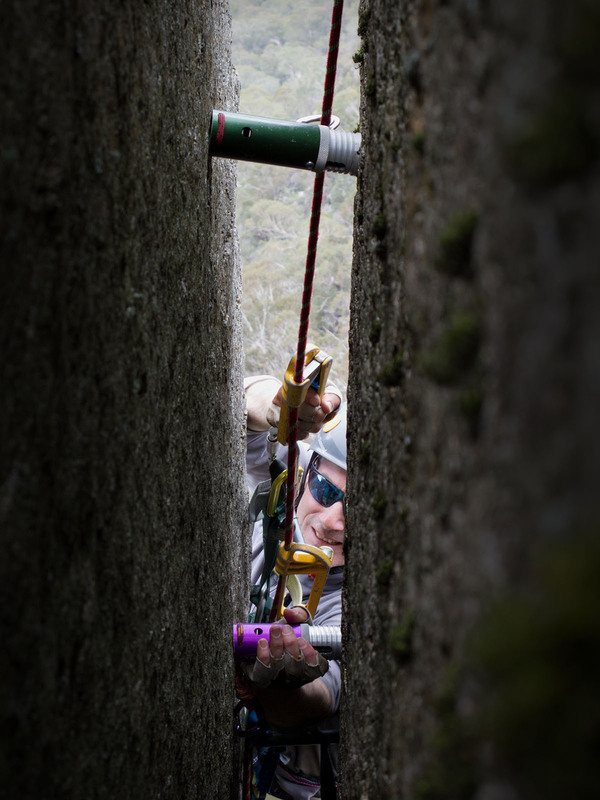 I’d been curious about aid climbing for years — big wall climbing as it’s called in the US. Daisy chains, etriers and fifi hooks I had heard about but had no idea what they where, and only a vague sense that aid was climbing pulling on the gear (as opposed to “free climbing” i.e. rock climbing with feet and hands, a distinction you’ll mostly hear from aid climbers). My interest is partly about becoming a well rounded climber; I’ve got my eye on ice and alpine climbing too, and partly wanting to experience the kind of skills and adventures I’ve been reading about. Also, I have to admit, I like messing about with gear. What is aid climbing? It is climbing using placements of protection (pro) — the normal climbing stuff plus aid specific things like: hooks, pitons, tomahawks, copperheads, etc. You clip a ladder or etrier to this then use it to step up on (two to four ladders / etriers are used and alternated as you move up). Daisy chains are connected to the top of the ladder and have many loops you can hook on to with a fifi hook attached to your harness close in, to rest or counter-tension to reach higher to make a placement. Lead and second climber work as for free climbing: belaying, cleaning gear etc. with added hauling if carrying multi-day gear. Aid is for climbs that are too hard to free climb, often very high and multi day climbs; though a lot of old aid climbs are now being “freed” — the Dawn Wall Project a now famous example. Considering my options for climbing any route over grade 17 (5.10b / 6a / 5aE1) would involve more skill and strength than I have, I thought I’d give aid climbing a go; only to find it is as physical and challenging as free climbing but in different ways — hanging from a talon is pretty freaky! 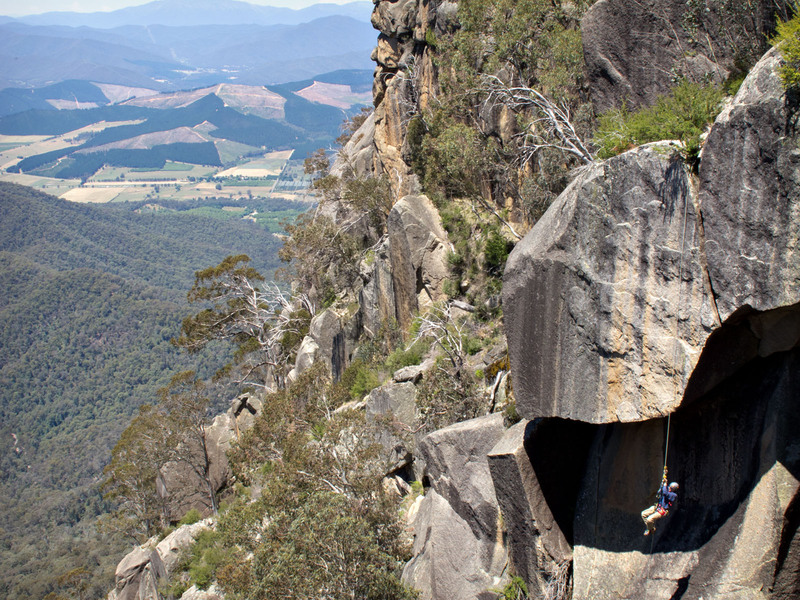 Fortunately some very experienced aid climbers got together via Chockstone (an Australian climbing forum) for an aid climbing weekend at Mt Buffalo, Victoria last year. Aidfest as it’s become known. I found out more via the forum and also managed to borrow some of the essential gear, even scoring some retired jumars and an evening introduction to ascending a rope (jugging) which is how the second climber gets up. 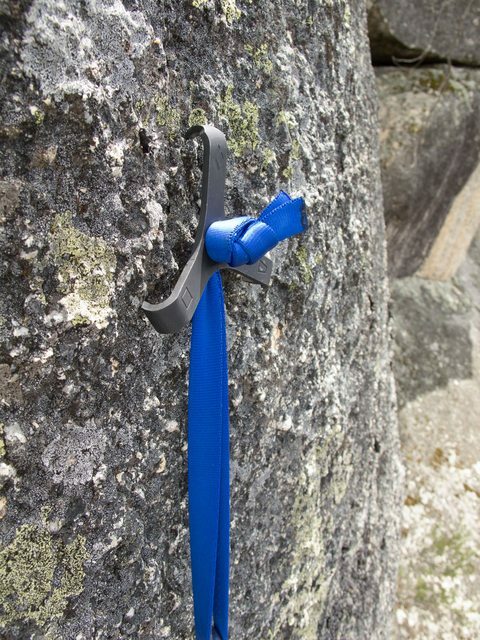 First impression — aid climbers are nice people. On the weekend it was great to finally be handling the gear I’d only seen photo’s of, as they talked through the whole process from leading to jugging, hauling, bivies (sleeping out on a climb) etc. 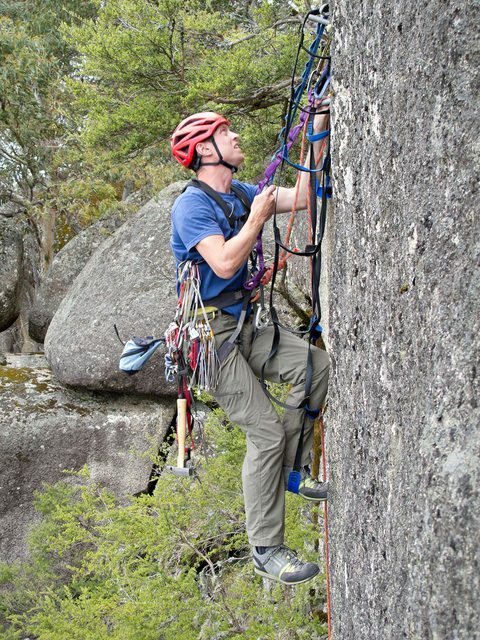 Great to see some home made gear, created and finely tuned to a personal way of climbing. I saw the idiosyncrasies of the different solutions and it made me realise there is no one way, it is whatever works for your own personal abilities / situation / gear / goals. It seems to me aid is an art of keeping a cool head while managing all the gear in the context of exposure and a massive potential for a tangle of etriers, daisies, rope and gear. Add to this the mental challenge of trusting freaky hook or cam-hook moves and faith in tiny RPs; I’d heard of the term ‘marginal gear’ but now I know what it means! Then having all this dialled in to make efficient use of energy on longer climbs, or to just survive if weather gets nasty and/or fatigue sets in. On multi day climbs the whole gig has to be meticulously planned: dehydration could set the scene for fatal mistakes. And there are the logistics of moving all the gear, food and water up with you. Aid climbing sure teaches you about placements, I’ve just whacked pro in what looked reasonable when free climbing, but bounce testing, weighting, then cleaning (removing) it after gives you pretty good feedback about what works. I thought they’d be a nightmare to get out; had never used my RP’s before but I managed to get all my gear back. NB smaller RP’s are only for aid climbing, designed to take body weight only: 3 to 4 kilonewton rating, not enough for a lead climbing fall up to 7kN. Good to revisit exposure as I don’t get much at my local crag. Even the short climbs at Buffalo are hundreds of meters above the valley with swirling up-drafts, it’ll take a bit of getting used to and confidence in my own processes… I’ll need to settle into all that. Processing and embodying all I’ve learned to evolve my own methods will take time and practice, plus a bit more gear accumulation (made my own ladders with the help of Industrial Sewing Workshop). There’s a whole lot to be finely tuned to make it all efficient, which doesn’t matter on short stuff but on bigger climbs or critical situations I can see the need. So I’m slowly putting together a coherent personal method from all the great ideas / solutions I’ve seen or read about. I get to my local crag and try this stuff out occasionally and am getting better / braver. If you want to learn more about aid climbing check out some great clips from Chris MacNamara on Supper Topo , support stuff for his book How to Big Wall Climb. Also there is a big aid section in Mountaineering, The Freedom of the Hills from The Mountaineers Books. Plenty of other good climbing stuff in this book too. Thanks to Dave for the great photos. May I suggest that you get some wrap around safety glasses? I have a small scar on my ear from an RP that ripped when I was testing it. Aid placements come out driven by gravity pushing on your body weight, aka, they come out really, really fast. Don’t risk an eye, especially when you’re on a big wall. Yeah Gerard, I usually wear safety sun glasses. I’ve seen the damage a tomahawk did to a helmet when it pulled. And I turn my head away when bounce testing.